Why is Castle Likely to be Canceled? Last issue, I stated that it was do or die time for Castle on its special Sunday at 10 time slot. The show right now is very low-rated and going through some contractual issues from what I've read, but I figured that if it managed to not go fractional last night, ABC could move it to the low-priority time slot next season and focus on growing Quantico's ratings. With a 0.8, though, that doesn't look like it's happening. That's significantly below both Quantico and last season's Revenge, and ties Nashville's series low. Combine that with the fact that Nashville is probably somewhat cheaper and that the city pays for production, I now see Nashville having more of a chance. 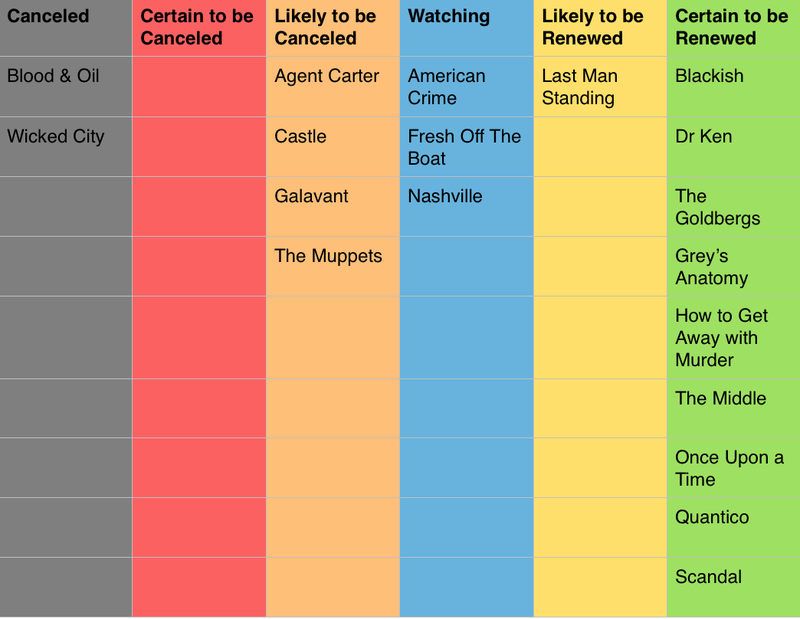 I would like to see how Nashville performs when it returns though; it's possible that both are canceled, but increasingly less likely that both are renewed. All three of Agent Carter, The Muppets, and Galavant are doing very poorly in the ratings right now. I wanted to say that The Muppets would have a chance at taking over the Sunday bridge time slot if/when Galavant is canceled, but it returned fractional despite the time slot upgrade and still-significant promotional push. Even a writer of The Muppets possibly inadvertently revealed that the show has been losing money (but will become profitable overseas?). I think it's time ABC cut their losses and cancel the show instead of sticking with it for the sake of corporate synergy and international revenue. I still feel hesitant about having The Muppets and Agent Carter, both corporate synergy shows, as likely cancellations, but can I really justify upgrading them when the ratings are so poor? If upfronts were tomorrow these would be the least surprising potential misses, but if they are renewed at least we'll know the reason.